Mariners Monthly Roundup: July “From Bad to Worse” Edition. Posted on August 1, 2010 by Notorious B.U.D. Michael Saunders is one of the few sources of hope in a dismal season. Top Hitter: With virtually the whole team slumping in the month it wasn’t difficult for second-year outfielder Michael Saunders to walk away as the best hitter in July. The 23-year-old began to show the potential that made him one of the Mariners most highly regarded prospects, hitting .279 with one HR and 6 RBI’s in the month. More importantly, Saunders flashed improved plate discipline with a 16/11 strikeout-to-walk ratio, leading to a .380 OBP. He’s shown himself to be an above-average defensive player and if he can continue to develop as a hitter, Saunders should be a major part of Seattle’s rebuilding effort moving forward. Top Pitcher: Felix Hernandez picked up right where Cliff Lee left off in June, although thanks to an anemic Mariners’ offense, the King only won a single game in July despite a 2.54 ERA and 33 strikeouts against only 9 walks. Besides Erik Bedard Luke French Ryan Rowland-Smith Justin Vargas, Felix is the only sure thing on the Mariners’ staff right now, and the team will have plenty of holes to fill heading into 2010. This team would be completely unwatchable if not for the presence of King Felix. 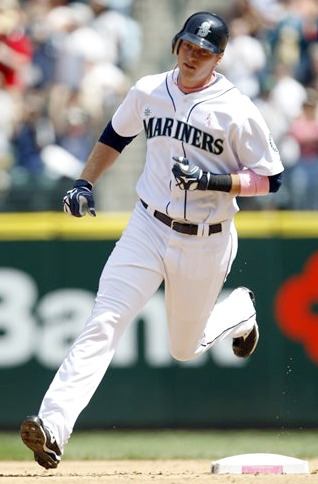 Biggest Surprise: Left for dead with the acquisitions of Justin Smoak and Russell Branyan, Casey Kotchman finally decided it was time to play like a big leaguer, hitting .318 with 4 HR’s and 10 RBI’s in the month. With Smoak currently in Triple-A and Branyan manning DH duties, Kotchman should see some significant playing time moving forward. He’s not part of the team’s future, but it would be nice to see him get a chance to play for another team–preferably in the division. Injuries: Erik Bedard (out for season–hypochondria); Milton Bradley (15-day DL–patellar tendonitis); Shawn Kelley (15-day DL–elbow inflammation); Ryan-Rowland Smith (15-day DL–overall awfulness–set to meet with Men at Work on Monday). Lingering Questions: Will the Mariners finish with the worst record in baseball? Will Ichiro be the only Mariner to finish the season hitting over .250? How long before the pitchers and hitters engage in a bloody civil war? Why do I keep watching if they bring me nothing but pain? Can Adam Moore possibly be worse than Rob Johnson? Should fans start showing up at the games with bags on their heads? August Schedule: 1 @ Minnesota; 3 vs. Texas; 3 vs. Kansas City; 3 vs. Oakland; 3 @ Cleveland; 3 @ Baltimore; 3 @ New York; 3 @ Boston; 3 vs. Minnesota; 2 vs. Los Angeles. Overall Grade: (F) I’m out of words to describe the abomination that is the Mariners, so this picture will have to do.